This data set describes select global soil parameters from the Harmonized World Soil Database (HWSD) v1.2, including additional calculated parameters such as area weighted soil organic carbon (kg C per m2), as high resolution NetCDF files. These data were regridded and upscaled from the Harmonized World Soil Database v1.2. The HWSD provides information for addressing emerging problems of land competition for food production, bio-energy demand and threats to biodiversity and can be used as input to model global carbon cycles. The data are presented as a series of 27 NetCDF v3/v4 (*.nc4) files at 0.05-degree spatial resolution, and one NetCDF file regridded to the Community Land Model (CLM) grid cell resolution (0.9 degree x 1.25 degree) for the nominal year of 2000. Figure 1. 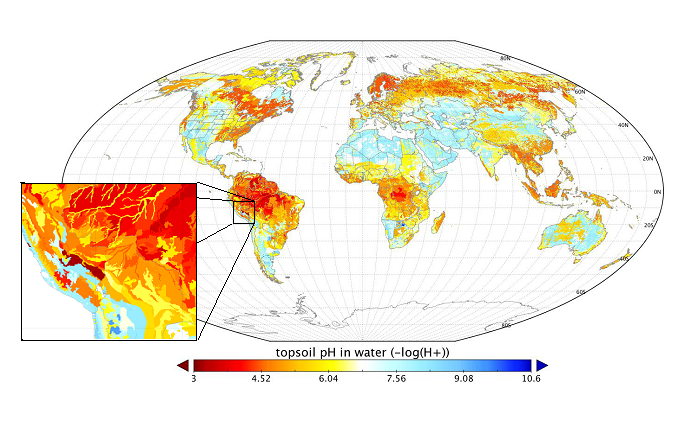 Global map of topsoil pH in water. Inset shows topsoil pH data for southern Peru and Bolivia as an example of the spatial detail available with the 0.05-degree files. Wieder, W.R., J. Boehnert, G.B. Bonan, and M. Langseth. 2014. Regridded Harmonized World Soil Database v1.2. Data set. Available on-line [http://daac.ornl.gov] from Oak Ridge National Laboratory Distributed Active Archive Center, Oak Ridge, Tennessee, USA. http://dx.doi.org/10.3334/ORNLDAAC/1247 . Investigators: William Wieder (wwieder@ucar.edu), Jennifer Boehnert, Gordon. B. Bonan, and Madison Langseth, National Center for Atmospheric Research. This data set describes select global soil parameters from the Harmonized World Soil Database v1.2, including additional calculated parameters such as area weighted soil organic carbon (kg C per m2), as high resolution NetCDF files. These data were regridded and upscaled from the Harmonized World Soil Database v1.2. The HWSD v1.2 (FAO 2012) represents the most exhaustive, comprehensive, and contemporary database of soil characteristics that is available for global analyses and is a powerful resource for evaluating soil biogeochemistry models. Soil characteristics in the HWSD represent data from real soil profiles at various stages of pedogenic development, land use, land use history, and disturbance history. Soil properties in the HWSD are available for surface soil horizons (0 to 30cm) and deeper soil profiles (30 to 100 cm). The HWSD provides information for addressing emerging problems of land competition for food production, bio-energy demand and threats to biodiversity and can be used as input to model global carbon cycles. The regridded HWSD data are presented as a series of 27 NetCDF v3/v4 (*.nc4) files at 0.05-degree spatial resolution, and one NetCDF file regridded to the Community Land Model (CLM) grid cell resolution (0.9 degree x 1.25 degree) for the nominal year of 2000. Data are presented as a series of 27 NetCDF v3/v4 (*.nc4) files at 0.05-degree spatial resolution, one for each soil parameter (listed in Table 1). Topsoil refers to soil between 0 and 30 cm and subsoil to soil between 30 and 100 cm. Grid cells with no data (fill value or missing values) are represented by “-1”. A companion file HWSD1.2_documentation.pdf contains a full description of the data compilation and harmonization procedure for the original HWSD v1.2 data. AWC_CLASS Available water storage capacity Coded values 1 through 7 1 = 150 mm water per m of the soil unit, 2 = 125 mm, 3 = 100 mm, 4 = 75 mm, 5 = 50 mm, 6 = 15 mm, 7 = 0 mm. REF_DEPTH Reference soil depth cm Reference soil depth of all soil units are set at 100 cm, except for Rendzinas and Rankers of FAO-74 and Leptosols of FAO-90, where the reference soil depth is set at 30 cm, and for Lithosols of FAO-74 and Lithic Leptosols of FAO-90, where it is set at 10 cm. ROOTS Depth of obstacles to roots Coded values 0 through 6 0 = no information, 1 = no obstacles to roots between 0 and 80 cm depth, 2 = obstacles to roots between 60 and 80 cm depth, 3 = obstacles between 40 and 60 cm, 4 = 20 and 40 cm, 5 = 0 and 80 cm, 6 = 0 and 20 cm. T_C Topsoil carbon content kg C m-2 Topsoil and subsoil carbon content (T_C and S_C) are based on the carbon content of the dominant soil type in each regridded cell rather than a weighted average. Table 2. HWSD_SOIL_CLM_RES file contents. Most data files contain grid cells at 3 minute x 3 minute (0.05 degrees or approximately 8-km). File “HWSD_SOIL_CLM_RES.nc4” provides eight soil characteristics at 0.9-degree x 1.25-degree resolution. The data set has no explicit temporal component. Data are nominally for the year 2000/01/01 to 2000/12/31. The HWSD provides information for addressing emerging problems of land competition for food production, bio-energy demand and threats to biodiversity. These data can be used as input to terrestrial biosphere models, such as the Community Land Model (CLM) (see Wieder et al. 2014). All fields in the Harmonized World Soil Database were checked for minimum, maximum, average, and standard deviation values in order to find outliers, data entry errors etc. Few errors were found, and these were corrected from neighboring units consisting of the same soil type. Few missing data values exist in the source databases. Many missing values were replaced with data extracted from the most appropriate neighboring units having the same soil type. The investigators regridded the HWSD from its native resolution to 0.05 degree resolution grid cells and upscaled these to the CLM grid, 0.9 degree x 1.25 degree. Using Environmental Systems Research Institute ArcGIS 10.0, they performed zonal statistics on the HWSD to obtain the most common HWSD soil mapping unit identifier (MU_GLOBAL) for each 0.05-degree grid cell. They then calculated the SOC by multiplying the soil organic C (%) by bulk density (kilogram per cubic meter) and soil depth for each soil mapping unit. They regridded the SOC pools from the 30 arc sec HWSD grid to the CLM grid cell using an area-weighted, mass-conserving algorithm. This area-weighting approach better represents the spatial heterogeneity of SOC pools within the larger CLM grid cell. More details can be found in Wieder et al. (2014). A full description of the data compilation and harmonization procedure for the original HWSD v1.2 data are provided in the companion file: HWSD1.2_documentation.pdf. Wieder, W.R., J. Boehnert, and G.B. Bonan. (2014). Evaluating soil biogeochemistry parameterizations in Earth system models with observations, Global Biogeochem. Cycles, 28, 211–222, doi:10.1002/2013GB004665. Saxton, K.E., W.J. Rawls, J.S. Romberger, and R.I. Papendick. 1986. Estimating Generalized Soil-water Characteristics from Texture. Soil Sci. Soc. Am. J 50, 1031-1036.